A user guide and training manual written for Project Management Professionals who wish to learn how to plan and control projects in an established Primavera Enterprise environment with or without Resources and Roles. This book is an update of the authors Primavera P6 Version 7 book and contains updated workshops, new content and an Earned Value chapter. It has been written so it may be used with any software industry version. The book is packed with screen shots, constructive tips and contains workshops with solutions at the end of each chapter for the reader to practice the skills taught. It has been written so it may be used with either the Professional Project Management Client version or the Enterprise Project Portfolio Management Optional Client.The book is aimed at: People who wish learn the software but are unable to attend a training course and find the software reference manual hard going; Project management companies who wish to run their own software training courses or provide their employees with an alternative text to the vendor supplied user manual; Training organizations requiring a training manual to run their own training courses. 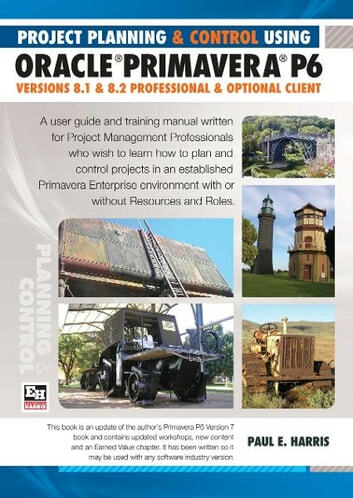 Primavera Systems Inc. originally asked the author to write this book and this publication is ideal for people who would like to gain an understanding of how the software operates up to an intermediate level. It covers only Primavera Versions 8.1 and 8.2 Professional Client and Optional Client Due to the new menus and toolbars release in Version 8. It explains some of the differences from SureTrak, P3, Microsoft Project and Asta Powerproject to assist people converting form other products. The book is designed to teach planners and schedulers in any industry how to setup and use the software in a project environment. It explains in plain English and in a logical sequence, the steps required to create and maintain an unresourced and resourced schedule. It tackles some of the more complex aspects of the software that the user manual does not address. It highlights the sources of information and the methods that should be employed to produce a realistic and useful project schedule. About the Author: Paul Harris holds an Honours Degree in Civil Engineering obtained in the UK and is a Certified Cost Engineer through AACEI International, a PRINCE2 Registered Practitioner, an Approved PRINCE2 Trainer and a Managing Successful Programmes Registered Practitioner. He has worked in the project controls industry for a number of years and has assisted many companies in a range of industries to set up and run project controls systems. His Melbourne, Australia based company, Eastwood Harris Pty Ltd, offers project controls consulting and training services worldwide with a strong focus on Microsoft Project and Primavera software.